At the most basic level, new ideas are about making connections. Steve Jobs said, “Creativity is just connecting things,” and the inner workings of the brain confirm this: When we learn something new, the antennae-like spines on one neuron swell and reach toward the spines of another neuron, forming networks of understanding. The difference between a highly creative brain and an average brain, then, might very well come down to the quantity and strength of those connections–and the ability to make them. In this post we’ll examine some of the neural underpinnings and behavioural traits that separate “creative geniuses” from the crowd, but we’ll also argue that anyone can improve their creative capacity by learning to make more connections on a day-to-day basis. First, let’s take a look at what distinguishes creative genius from the more traditional notion of genius. In other words, how is the kind of connecting that goes on in the creative mind different from the connecting that goes on in an intelligent mind? Are creativity and intelligence the same thing–just making connections? Research from the California Institute of Technology showed that intelligence is something found all across the brain, rather than in one specific region: The researchers found that, rather than residing in a single structure, general intelligence is determined by a network of regions across both sides of the brain. “Several brain regions, and the connections between them, were what was most important to general intelligence,” they explained. At Washington University, a research study found that connectivity with a particular area of the prefrontal cortex has a correlation with a person’s general intelligence. This study showed that intelligence relied partly on high functioning brain areas, and partly on their ability to communicate with other areas in the brain. Shouldn’t creativity behave the same way? A useful explanation for the difference between intelligence and creativity, then, is the “convergent vs. divergent thinking” paradigm. Convergent thinking is the type of thinking that focuses on coming up with the single, well-established answer to a problem. It is oriented toward deriving the single best, or most often correct, answer to a question. Convergent thinking emphasises speed, accuracy, and logic and focuses on recognising the familiar, reapplying techniques, and accumulating stored information. By contrast, divergent thinking typically occurs in a spontaneous, free-flowing manner, where many creative ideas are generated and evaluated. Multiple possible solutions are explored in a short amount of time, and unexpected connections are drawn. After the process of divergent thinking has been completed, ideas and information are organised and structured using convergent thinking to decision making strategies are used leading to a single-best, or most often correct answer. Standard IQ tests measure convergent thinking. Logic thought flow, pattern recognition, the capacity to solve problems and testing knowledge can all be evaluated and graded in these tests. Standardised multiple choice questions are also an example of testing convergent thinking. What does this mean? Simply put, creative genius is another beast entirely. And the key lies in that generation stage–when novel connections are made. What’s In a Creative Genius? But it wasn’t enough to separate creative from non-creative types–just to help define a creative activity. Next, Andreasen decided to actually test subjects for levels creativity. Andreasen and her team began the second study with an MRI scan, during which subjects performed three different tasks: word association, picture association, and pattern recognition. Each experimental task alternated with a control task: during word association, for example, subjects are shown words on a screen and asked to either think of the first word that comes to mind (the experimental task) or silently repeat the word they see (the control task). Andreasen is about halfway through the study, and has studied the minds of filmmaker George Lucas; mathematician and Fields Medalist William Thurston; Pulitzer Prize winning novelist Jane Smiley; six Nobel laureates from the fields of chemistry, physics, and physiology or medicine; and several winners of the National Institutes of Health Pioneer Award and other prizes in the arts. She has found overwhelming evidence that creative geniuses like these people are more adept at drawing novel connections than less creative people. Naturally, the next question is, are creative geniuses born that way? Or can we teach anyone, including ourselves, to draw more connections? We believe there’s plenty of evidence suggesting creative genius can be learned. 1. Tap into mixed emotions. Until now, creativity researchers have been of two camps: those who believe positive emotions enhance creative thinking, and those who believe negative emotions enhance creativity. But research scientist Christina Fong at Carnegie Mellon University has found evidence to oppose both theories. Instead, she’s found that “emotional ambivalence”–the simultaneous experience of positive and negative emotions–actually fuels creativity more than either extreme on its own. In other words, mixed emotions fuel divergent thinking. But why? Fong’s research suggests that simultaneously experiencing multiple emotions that are not typically experienced together (e.g., excitement and frustration) signals to the brain “that one is in an unusual environment where other unusual relationships might also exist.” This increased sensitivity to unusual associations is another important contributor to creativity. In her pivotal study, Fong used a writing exercise to subtly manipulate the moods of her participants by asking them to write about a time they were happy, sad, or a moment when they recalled experiencing mixed emotions (“emotional ambivalence”). Then, she had them take the Remote Associates Test, a task psychologists often use to measure creativity in the lab. The test lists a series of three ostensibly unrelated words–like “envy,” “golf,” and “beans”–and asks the test-taker to identify one word that unites all three terms (in this case, the answer is green). As she suspected, Fong found that the people who had been assigned to write about a time they felt mixed emotions were better at this task, coming up with more words that united the given three. 2. Rely on different levels of attention for different tasks. Especially in an educational setting, we tend to think of attention as a very clear-cut, have-it-or-you-don’t mental state. “Do I have your undivided attention?” teachers ask. “Stop daydreaming,” they demand. Students are either paying attention or distracted–the first good, the second bad. But the research says it’s more complicated than that. A recent study led by Kaufman and neuroscientist Roger Beaty suggests that creative people have greater connections between two areas of the brain that are typically at odds: the network associated with focus and attentional control, and the network associated with imagination and spontaneity. 3. Do creative work in an “unusual” environment. Christina Fong’s research also suggests that unsual environments, not just emotions, can increase creative thinking. Highly innovative companies such as Disney and IDEO, for example, deliberately provide their employees with unusual working environments. IDEO’s workplace in Palo Alto, California has airplanes and bicycles suspended from the ceiling, plastic beaded curtains used as doors, and Christmas tree lights on display all year round. Everywhere you go are toys, gadgets, and prototypes from past projects. 4. To solve a problem, ignore it. You may have heard recent studies on the benefits of walking as they relate to creativity. The same phenomenon is at work here–namely, a type of subconscious free association that permits the brain to make more varied connections. 5. Seek out new experiences. 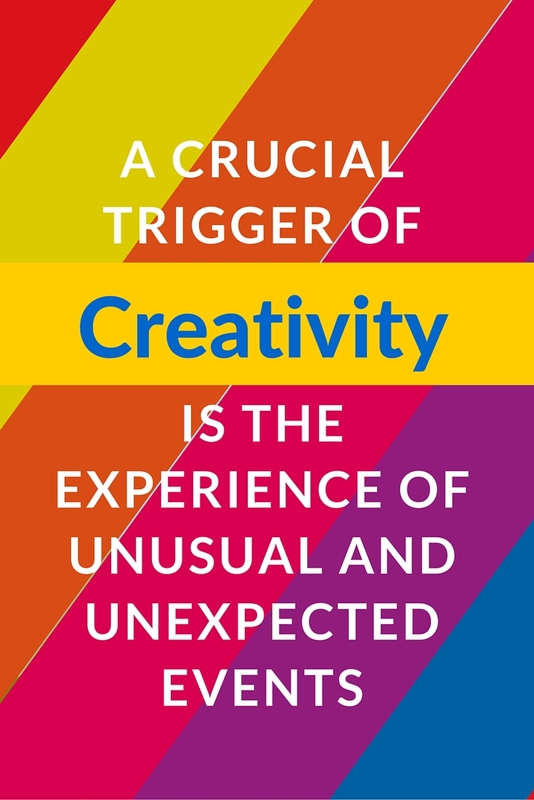 “Multiple psychological studies suggest that a crucial trigger of creativity is the experience of unusual and unexpected events,” Kaufman says. “Unexpected events can certainly mix emotions, and mixed emotions, as Fong as shown, can increase sensitivity to unusual associations and ideas.” This may be one reason why creative people tend to be prolific readers as well: they are continuously introducing their brains to new ideas and perspectives, and even “experiencing” new things. To test their idea, the researchers put people in a virtual reality world where participants took a virtual three-minute stroll through the university cafeteria, and during the course of their walk experienced weird events that violated the laws of physics. In one event, for example, as people walked closer to a suitcase standing on a table, the size of the suitcase decreased, but as they walked away, its size increased. They also had people take a test of cognitive flexibility where they were required to come up with as many ideas as possible to the question “What makes sound?” Those who had been actively engaged in the weird virtual-reality world scored higher on the test of cognitive flexibility than those who had engaged in a normal version of the virtual world. I desire to make Indian kids innovative and creative. What is the process shall I apply ?